Give me a beat! 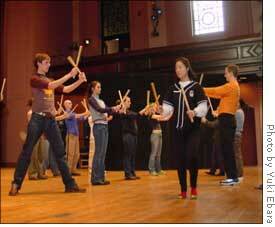 Oberlin students show their new Taiko skills in the Taiko workshop. Last Tuesday, the Portland Taiko Ensemble, an award-winning Asian-American drumming group, gave an energy-filled performance that captured all the senses of the enthusiastic audience that filled Finney Chapel. In her introduction, Anne Ishimaru, co-director of the ensemble, remarked that in addition to serving as a wonderful form of entertainment, she likes to think that Taiko also serves to counter stereotypes about “weak Asian women.” Although taiko is traditionally a male art form, four of Portland Taiko’s five-member cast are female. As Shansi Student Committee co-chairs Ellen Chai and Yukiko Shishikura noted in their introduction, taiko, the Japanese word for drum and the name of the art form, has its roots in ancient Japanese tradition and was used in religious ceremonies, community festivals and theater. The confines of villages were defined by the distance from which the community taiko could be heard. American taiko came into being in the 1960s and was a powerful symbol of voice during the struggle for redress of the Japanese-American internment during World War Two. Tuesday night the performers wore red and black patterned sleeveless shirts and airy black pants. The fabric of the pants is so lightweight, in fact, that several of the cast members commented after the show that they often find themselves wondering in mid-dance whether they are still properly covered. The cast of the Portland Taiko Ensemble don’t merely play their drums, they dance with them. In each number the massive drums, each approximately two feet tall, were arranged in a different formation. Some of the drums were placed on wooden stands so that the head of the drum faced the performer. In several of the pieces the largest of the drums, the height of which exceeded that of the performers, was placed on its side, upstage and center, serving as a powerful centerpiece. The performers stood with their legs spread apart, almost in a split position, with one foot facing forward and the other pointed sideways. With looks of determination, they would hit their drums, often raising the sticks above their heads sometimes twisting the sticks like batons in a series of quick, precise and intricate movements. The performers danced with incredible energy and precision as they played, rotating from drum to drum, sometimes leaping in the air. Often more than one performer would share a drum. Several of the pieces also featured accompanists on the violin or a horizontal wooden flute. One such piece beautifully fused the staple drumming with a wistful violin duet. In another number, a set of fan drums, drums without a barrel with a shape resembling that of a hand mirror, were used, producing higher tone variations. In several of the pieces, a number of smaller percussion instruments were also incorporated. These included a traditional Japanese instrument called an atarigane, a small brass gong that is hit with a mallet to produce a clear, ringing sound, and wooden blocks called claves, which produce a more airy gong-like sound, as well as traditional cymbals. Several of the works also had vocal elements, and the performers periodically chanted words, called “kiai”. Each of the pieces was distinct. Amaterasu, or “The Sun Goddess,” an adaptation of an ancient Japanese story of the sun goddess and her mean-spirited brother Susano, was the only narrated piece. In the piece, one of the performers danced with a sequined cloth, representing the sun, in a fashion almost reminiscent of ribbon dancing. One fast-paced piece that would leave all but the most talented performers resembled a Japanese-American and more sophisticated version of something out of Drumline. Two of the performers simultaneously played a series of four drums, as well as a set of fan drums, which stood on a stand about chest height, generating lighter, more airy sounds. One of the most popular pieces was a playful work created by performer Rachel Ebora. The piece, Ebora remarked in her brief introduction, reflects her kooky sense of humor and thoughts of her homeland, the Philippines. The comical piece, entitled “Lima,” the Tagalog word for five and Ebora’s favorite number, was filled with mock combat. The piece had a clown-like aspect to it, even incorporating squeeze horns, which made it stand out from the numerous traditional works. By the end of the performance the audience was on their feet and the performers returned for an encore which was punctuated by the spirited claps of the spectators.